The action of climbing and the climber’s weight causes the circular surface to rotate. The rotational speed is controlled by a patented mechanism and allows climbing on either side and the speed to be adjusted from slow to fast. Anywhere there’s a wall, Freedom Climber will fit. Will it fit my wall? There are five basic exercise activities that are associated with fitness and health. Only one works the whole body and engages the mind as well! Most fitness facilities have treadmills, spinners, and rowers. Few have swimming and climbing. Swimming is always complicated from a facilities perspective. Climbing used to be complicated, until now. The display can track the progress of three different climbers simultaneously. For example, three climbers are wanting to challenge each other during a 30 minute workout. Climber 1 hits the start button and climbs for 3 minutes. Then, when the back button is pressed, Climber 2 can choose to start and climb for 3 minutes as well, and the display will track the elevation climbed and calories burned. Then Climber 3 can do the same and when done, press back which allows Climber 1 to resume where she left off. At the end of the 30 minutes each climber can see how many feet they climbed in relation to the others. The static panel (highlighted) is a 4 foot wide panel with the same surface as the Freedom Climber. It is flush with the Freedom Climber so climbers can traverse on and off. The holds on the panel are configured for plyometrics. The Freedom Climber comes standard with gray holds. But you can customize your Freedom Climber by choosing holds that match your branding or complement the design scheme in your space. The wall must be structurally sound. It must be connected to the floor beneath it and the ceiling/roof structure above it. A partition wall is not adequate. If the wall could be used to support the anchors for a body weight suspension system like TRX, the wall is adequate to support the Freedom Climber. The ideal wall composition is wood studs. Masonry walls are a good composition. 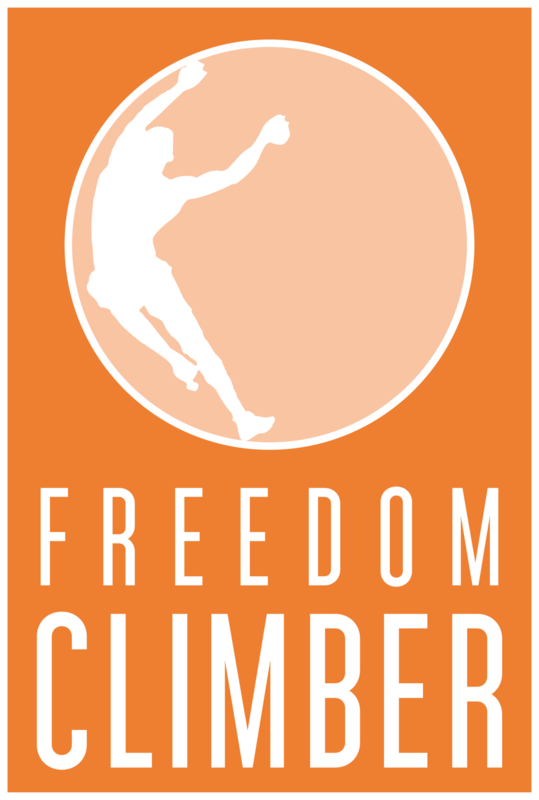 Where is the Freedom Climber Made? The Freedom Climber is made in the USA in Lancaster County, Pennsylvania. The Freedom Climber comes unassembled in a crate that is 48” wide, by 96” long, by 26” high. How do I get it into my facility? When the crate arrives, the components can be removed and carried in through typical size doors just like furniture is brought in. Would my wall need to be reinforced to hold it? The only requirement concerning the mounting wall is that it be structurally sound, which most walls are. The exception is partition walls which is not structurally sound in that it has no structural connection to the structural ceiling members above. Will it fit in rooms with 8' ceilings? Yes. By leaving off the top trim piece, the Freedom Climber has a height of 94” which is 2” shy of the 96” ceiling height found in many homes. If you have lower than 8′ ceiling, you can order an 86″ version of the Freedom Climber (pictured below). Can the Freedom Climber stand alone? No, the Freedom Climber is always mounted to a wall or other structure that provides stability. Does the Freedom Climber require electricity? No, the Freedom Climber does not require electricity to operate. However, it the optional digital display is chosen, it requires a 110 volt power supply. The Freedom Climber is virtually maintenance free. The climbing surface may need wiped down on occasion and the climbing holds checked for tightness. 275 pounds. Two people can climb at the same time but in that case the weight distribution is spread out. If I put a Freedom Climber in my fitness center, where is my Return On Investment (ROI)? Facilities that strive to provide unique and challenging experiences for their membership increase the likelihood of retaining those members and attracting new members. Because the Freedom Climber also functions as a workout station, members who like to workout together can create their own circuits that meet their fitness objectives. Trainers can also create circuits that become part of their personal training. Click here to watch Jim Launer from Spooky Nook Sports on why Freedom Climber is perfect for fitness centers.